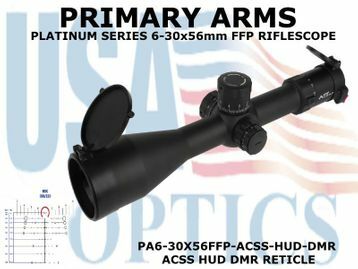 This 6-30x56mm PLX5 Platinum series scope is equipped with the first focal plane ACSS HUD DMR reticle, the most advanced moving target reticle in the world. Capable of guiding the shooter to first shot hits on moving targets out to a never before seen 600 yards, HUD DMR even accounts for three different target speeds. You can't hit any target if you don't know how far out they are, so HUD DMR takes the guess work out of range estimation. The integrated ranging system quickly and accurately provides target ranging, wind holds, and bullet drop compensation out to a full 1,000 yards. Tuned for common .308 Winchester loads, this reticle can be used with some .223 Remington loadings as well. The ACSS HUD DMR is perfect for shooters looking to make fast hits on targets out to 1,000 yards. Primary Arms advanced reticle designs promote set-and-forget zeroing, but for those who prefer to count their clicks, the Japanese made platinum series features tactile, audible, and -- more importantly -- precise and repeatable 0.1 MIL click adjustments. Once zero has been achieved, the finger-adjustable turrets can be easily reset to 0 as well, allowing future adjustments to be readily tracked. To protect your zero, the turrets are locking. Pull out on the turrets to make your adjustments, push in to lock them down and ensure bumps on the range or in a bag won't throw off your zero. Whether you're looking for a workhorse optic for tactical shooting, competition, or out on your next hunt, the uncompromising clarity and quality of Primary Arms PLX5 Platinum may be exactly what you're looking for. These remarkable precision scopes will help you dominate from mid-range to beyond the 1,000-yard line. To top it off, this fantastic scope is covered by Primary Arms lifetime warranty.